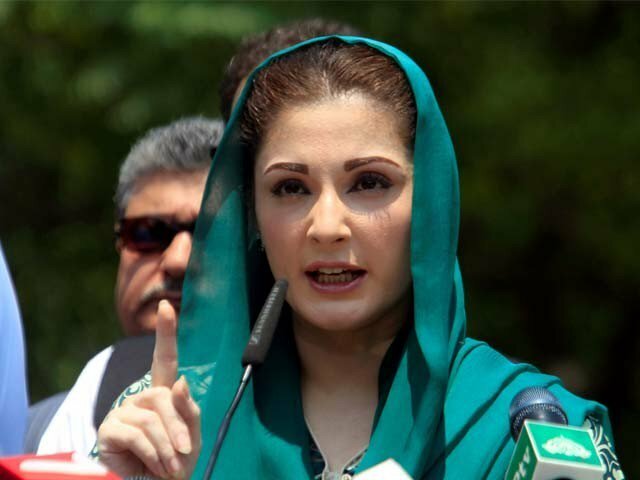 Former first daughter Maryam Nawaz on Monday said that while she could not make any predictions regarding the upcoming general elections, she would honour any role or responsibility "given to her by the party", the ruling PML-N. Speaking to the media in Lahore, former prime minister Nawaz Sharif's daughter said the party had given her the responsibility of running the campaign for the NA-120 by-polls on behalf of her mother, Kulsoom Nawaz, who has been undergoing treatment for cancer in London. "Next time if the party thinks that I should have a role or a responsibility or contest an election then I will do so," Maryam said. Kulsoom Nawaz had contested ─ and won ─ the NA-120 seat which had fallen vacant after her husband's disqualification by the Supreme Court in the Panama Papers case. During her press conference, Maryam further said that the country's institutions should work within their constitutional limitations and with respect for each other. She was responding to a question asking her how she responded to Hamza Shahbaz — her cousin — coming out strongly in support of the army. She added that if each institution respected the constitutional jurisdiction of the others, it will benefit the country. Maryam also criticised the on-going corruption cases against her and members of her family in accountability courts. "The case that was never about corruption or money laundering is being heard. This is the first time that the verdict was delivered before the cases were heard," she said, referring to the party's refrain regarding the Panama Papers case. "We have heard that they are also looking for evidence. First, they delivered the punishment. Now, they are looking for proof," he complained. When asked by a reporter who it was "looking for proof" against her family, Maryam replied: "those who have not been able to find evidence so far". Announcing its verdict in the case on July 28, the Supreme Court had ordered the National Accountability Bureau to open references against members of the Sharif family. Following the verdict that ousted him, Nawaz had launched a campaign where he said that the court's decision had violated the sanctity of the vote. "We should not hope for justice. The way this process has been carried out.. the whole world has seen. This kind of planning is short-lived. Now the facts will come forward," she responded obliquely. "The PML- N is united and will remain so," Maryam said in response to a question by a reporter probing rumours of a widening rift between the brothers Shahbaz and Nawaz. "The workers of the party, even more so than before, are standing with Nawaz Sharif. The workers are fighting for the sanctity of their vote and carrying forward Nawaz's narrative."